Some D.C. doctors are skipping traditional medications. Instead, they're writing their patients prescriptions for fresh fruits and vegetables. WASHINGTON — Three months ago, it was rare for Tantalia Hall to bring fruits and vegetables home from the grocery store. When it came to purchasing food for her family of seven, the Northeast D.C. resident stuck mostly to the bargain bins, filled with processed packages and canned goods. The absence of fresh produce had an impact on Hall’s overall health. She had difficulty moving around and was diagnosed with blood sugar issues. It wasn’t until Hall’s physician wrote her a prescription that she was able to get her health back on track. The prescription, however, was not for blood pressure medication or diabetes-related drugs — it was for fruits and vegetables. Hall is one of nearly 400 D.C. residents to receive a written prescription for fresh produce in the last three years, and it’s all thanks to DC Green’s Fruit and Vegetable Prescription Program. 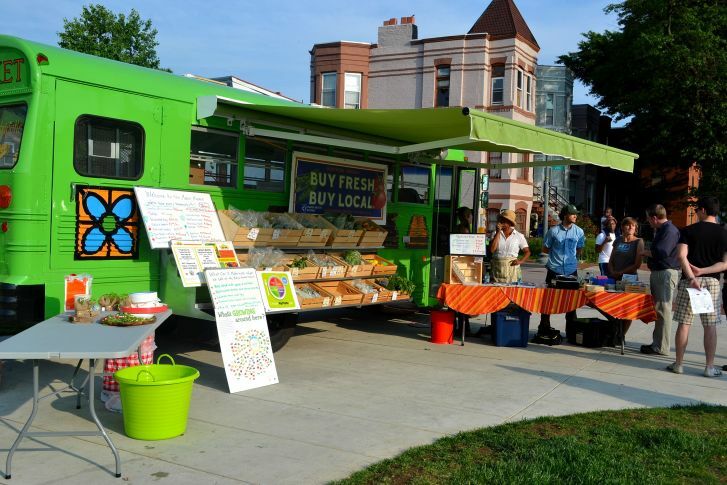 The program works with four D.C.-based health care centers and several farmers markets to help low-income patients who are struggling with chronic disease related to obesity, such as hypertension, diabetes, joint issues and more. Participants who receive a doctor’s note for free fruits and vegetables are required to enroll in a weekly wellness program, which includes nutrition education and physical activity components. Sorelle Cooper, a nurse practitioner and assistant medical director at Unity Health Care’s Parkside location, runs the Fruit and Vegetable Prescription Program in conjunction with The National Institutes of Health’s program, We Can!, at the Northeast D.C. health clinic. Cooper decided to start the program after becoming frustrated with how little time medical providers are able to spend discussing prevention, education and disease management with their patients, especially those with a chronic illness, such as diabetes. “With diabetes, the management is so inclusive of all aspects of your lifestyle. It really is important to talk about more than just medication with patients,” Cooper says. Now, she spends quality time with her patients outside of the exam room, leading activities and lessons that build on traditional medical advice. Each week, program participants might watch a cooking demonstration, learn about portion sizes, taste quinoa for the first time and take a Zumba lesson. After each class, the Arcadia Mobile Market pulls up to the clinic to meet participants who are eager to cash in their prescriptions. The amount each patient is given to spend on fresh produce at the market is based on the family size of the participant. Hall, who has a large family, receives a prescription that is worth $70 a week — an amount she calls “very generous.” The prescription enables her to buy plenty of apples, blueberries and kale for her family, but it also allows her to get adventurous with her selections. Recently, Hall picked up fennel at the market. “It looked weird, and I didn’t know exactly what it was,” she says. But she decided to give it a try anyway. She brought the vegetable home and sautéed it in a pan, just like an onion. “It was more of a nuttier taste, but it still had the feel of onions, so it was a really good experience of trying it,” she says. And while sweet corn, juicy tomatoes and plump peaches are in peak season now, Hall is already preparing for the months when they won’t be around. Because the Fruit and Vegetable Prescription Program is dependent on the city’s farmers markets, it only runs from June through November. Therefore, teaching various methods of preservation — from freezing to canning — is an important part of the classroom lessons. “If we have an abundance, we’re able to store them for later on when the program is no longer running,” Hall says. Lillie Rosen, the food access director at DC Greens, says $40,000 worth of prescriptions have been issued to patients over the past three years and 80 percent of that money, which is funded by DC Greens and the DC Health Department, has been redeemed. “What we hear from the health care providers is that this gives them a way to actually help their patients make a change in their diet because they know that the biggest barrier for many of these patients is not knowledge … it’s money — being able to actually afford the fresh fruit and vegetables that they’d like to be able to purchase,” Rosen says. The Fruit and Vegetable Prescription Program has done more than help families increase the amount of food available at home — it’s helped shrink waistlines. Since starting the program in June, Hall has lost 7 pounds. “I’ve felt healthier, and feeling healthier made it easier for me to exercise and to be more mobile. And that, in turn, has resulted in weight loss,” she says. The program has also seen a 61.5 percent increase in patient retention. Unity Health Care’s Cooper says she’s had several patients ask if they can repeat the program. “To be able to have a reason to go back to your health care provider, every single month is huge because it gives the health care provider an opportunity to talk to the patients about the little things that might need tweaking in their medications, or might need tweaking in their understanding of what it is that their supposed to be doing to reach their health goals,” Rosen says. Cooper says the ability to give patients a free solution to improve their own health and the health of their families is priceless. “We’re selling this product of improved health care, of improved diet, of greater exercise, and it makes it so much easier to sell that product to our patients when we can say, ‘Listen, we are helping you to actually get what it is that we are recommending for you,’” she says.